No, really! They're not ALL copies! I started drawing a very long time ago. I think I was three or four years old. Most people are, then. And, like most people, I stopped drawing as soon as my creative products didn't meet my expectations. After many wasted years, I began drawing again as a senior in high school. I'd like to think that I can look at the sketches below and see me improve with time. But, being me, I tend to care about such things more than most people. I'd like to think that you, then, can look at the sketches below and see something you enjoy. "Ok... the useful 3 minutes of class are over now. Surprising how much this reminds me of high school... jr. high, elementary for that matter. Suddenly, a class where all the concepts build from each other—my brain builds them automatically in seconds, the class painstakingly illustrates them for an hour and a half. And, amazingly enough, college students manage not to get it. Scary, really. So- I'll try to occupy myself by shooting people and blowing things up! Wow. Video games are so bad for our children, no?" I was in honors yesterday lamenting a recent trip-up in class. I felt like sighing and dropping my head against the desk. Since we were in the middle of our Honors Intellectual End-of-the-Semester Event, though, I couldn't... so I started drawing myself doing it. Quickly, I realized it wasn't me I was drawing. Then I realized it was working on being me again, and in the end... it's just ... there. Anyway, yet another example of Amano's influence (see below). thud. 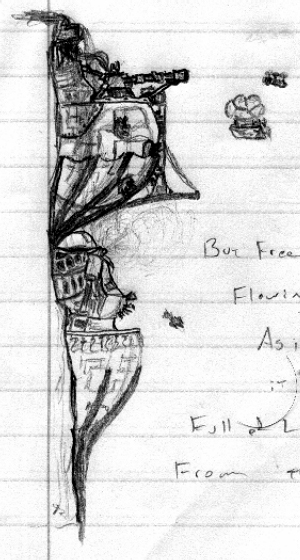 I was in Economics, thinking about ... all sorts of things, and this started popping out. At varying points, it got better and worse, but eventually came out as something that I felt alright showing to the world. I hope you agree. If it seems strangely familiar, then you probably saw Yoshitaka (?) 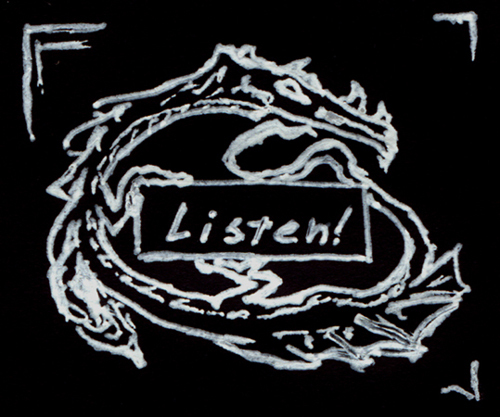 Amano's artwork for Final Fantasy VI (III, here in the US). I think since FF9 is coming out tomorrow, I've been heavily influenced subconsciously by Amano recently. Anyway... ask me if you can't figure it out. I know it's very confusing. 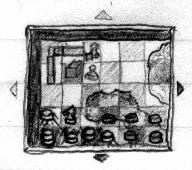 This is a small sketch of a game that I've been wanting to create for much of my life. It is called Divide & Conquer, which somehow in my mind came out as D&Q. I'm strange... but you all knew that. Anyway, it arose from a long period of boredom at a Suzuki institute in Aspen, Colorado, with me having nothing to do but play with chess and cheker pieces and a few boards. Let us hope that someday the game sees the light of day. This is a sketch I did a looooong time back of the Fossil watch that my dad gave me. Maybe if I hadn't spent so much time drawing instead of taking notes, I'd be doing better in calculus right now... but that's ok. Drawing actual objects is fun, don't you think? Huh? ... Where the heck did he come from? Not me, I say! 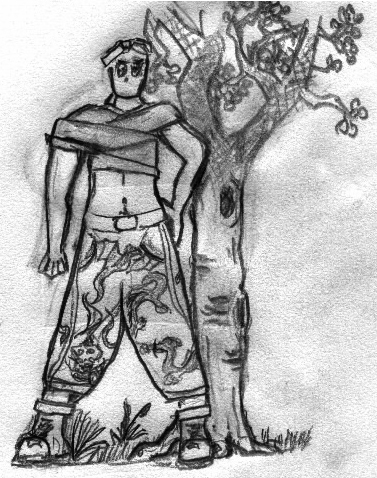 He just appeared in my sketchbook. It's funny, too... I was watching the whole time. Even holding the pencil. Maybe something deeply freudian wants me to draw. Who knows... anyway, there is someone for you to look at. Don't make fun of my tree, please. This is the nice Gargoyle that sits on my desk, wedged between my monitor, Lava Lamp, and speakers. He is the sacred guardian of my few drawing materials, and I'm afraid I can't blame the scanner for not doing him justice. But... I figured you could use at least an introduction! So here he is. 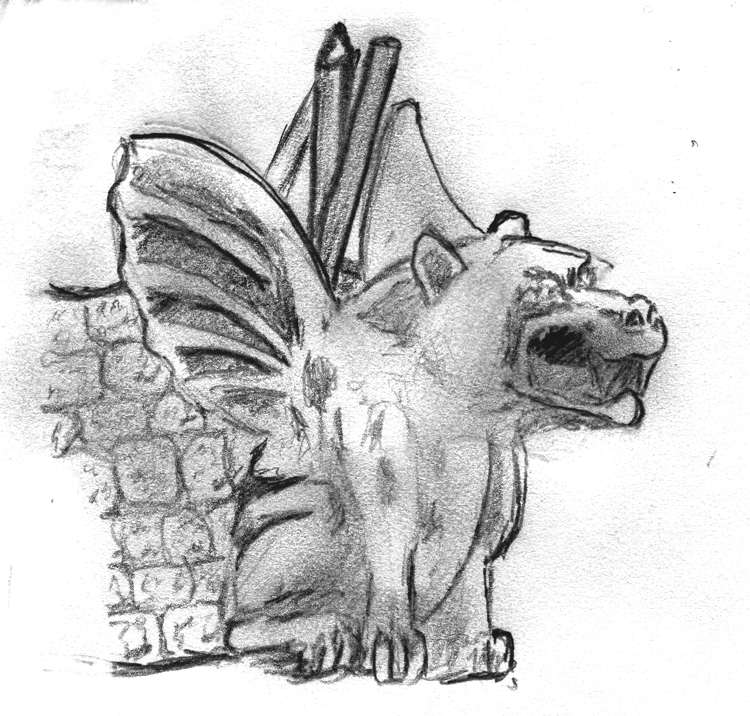 Everyone say hi to the Gargoyle! My favorite sketch so far! Now if only the scanner had done it any justice whatsoever. Those of you who have seen a bit further down on the page may have noticed that I really like foxes. Horses, however, were my first obsession. They just don't lend themselves so well to anthropomorphic states. Horses are beatiful as they come, and here is a nice one. 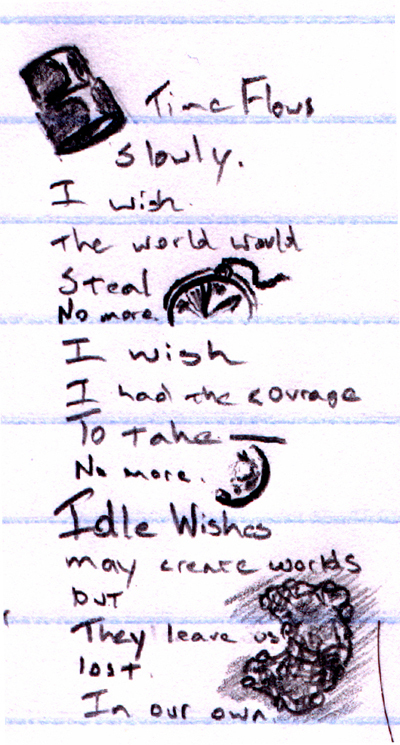 This was one of the first sketches in my official sketchbook, for which I owe Shelley Schoenhals many thanks. For those of you who cannot tell, it is a planet with the sun just about to rise... Not earth, really, but just the sort of pretty scene one might see from space, if one were so lucky to be there. This is Mr. Music Dragon! I needed something to go in the upper left corner since I was changing how I did stuff... so, 15 minutes, a White-gel-pen, and a black post-it-note later, this little critter was born! Ain't he cute? Sorry the thing in the upper left is such a massacred bend-strech of him. It just had to be that way, I suppose. Funny looking scan. Hey! New stuff :) Aren't you happy? I'm sure you are. 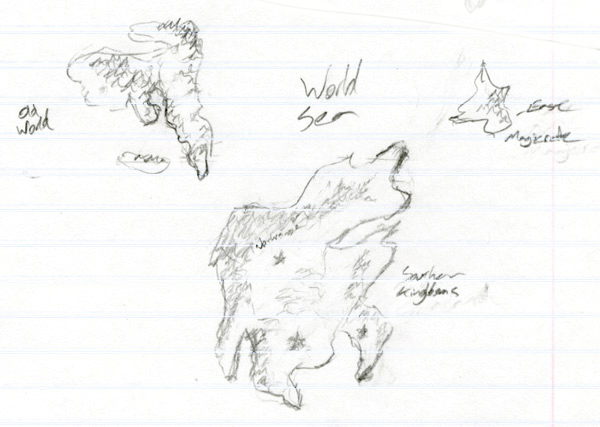 Anyway, this is a really rough sketch, but I think I finally decided on the continents that are in my game. Too bad I don't have a real artist for the non-map pictures, but the Maps I can do. As the next picture shows, I hope! Here is a detail of the Old World. It is the first official map ever done for my RPG, and took a while to do, but I'm glad to have found I still have it in me. 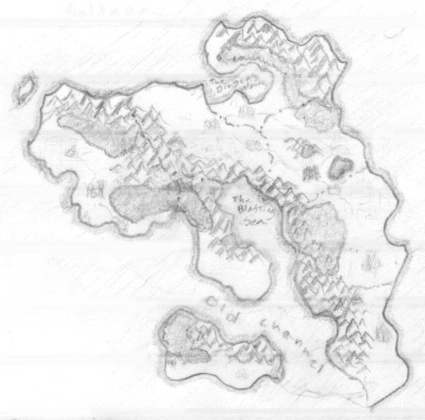 OK, country names are: Bottom Island-Arin Bottomright-Falkenn Just above Falkenn, with the forest on the wester part is Rekallis. The peninsula just west of Rekallis is Elan. 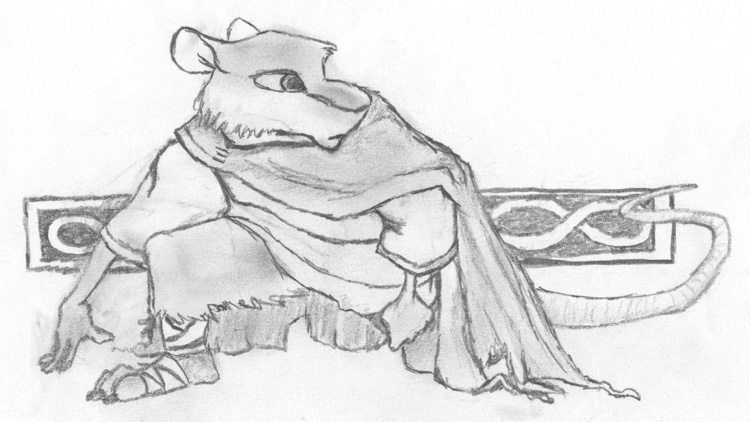 The Northernmost little scrag-thing is Saris. For now anyway. The three Northernmost countries all on mainland are Rendell, west of the mountains, Alsarin in the middle- just above Elan, and Carradan (yes, the place which has mountains with a mod to their name) is the easternmost, between Rekallis and Saris. That's about it. I hope you like the map, cause I sure do =). Hey, this doesn't look like Tracy's work! Guess why ;) .... because it's NOT! I drew this for fun, but I suspect it'll end up integrated into a wob page of mine sometime soon. Yah, a wob page, that's it. 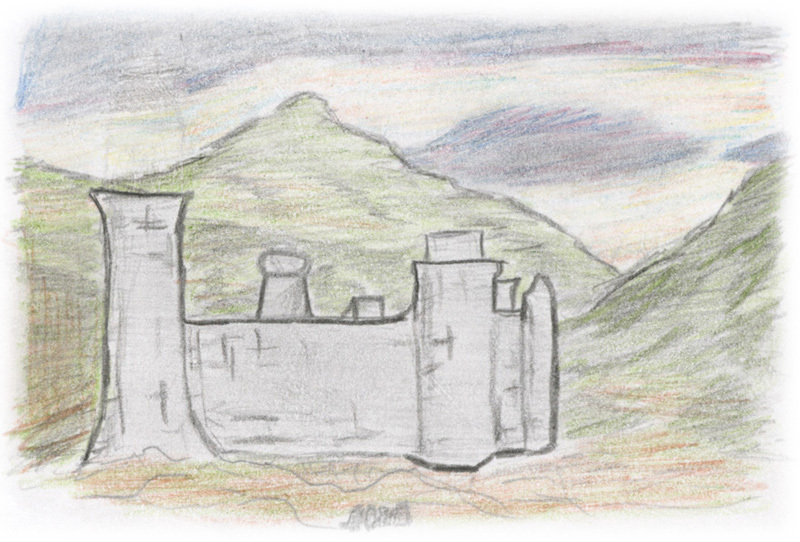 Anyway, cute little castle with painted clouds and stuff, also almost the ideal size for an 800x600 desktop by total accident. I think. Or did I change that? Anyway, I'm happy! It's mine, mine, all mine! 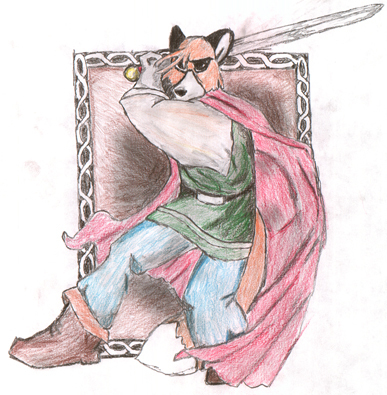 Fox standing there with a sword. Tracy doesn't like this one, but I don't think it's that bad. My rendition is pretty terrid (<— not a word ^_`) but anyway, it's stuff. Copyright Tracy of course. Don't want her mad at me, she sends Xaphan after people who plagiarize her stuff. Pointy teeth, eep! Griffin, also known affectionately as griff ^_^. He likes going around low to the ground, jumping off things, and even climbing stuff. General sneaky fun activities. So do I- much fun. Especially jumping on and off of things, as my friends all know really well ;) So, here he is. It took me so long to get this right, but it's ok now. Griffin is copyrighted like all of Tracy's stuff here to Tracy Butler. Cassy stands up and looks ... well, cassylike ^_^. You will note if you look at the full-size image, that all the lines were drawn fuzzy. No, that's not the scanner, I claim full responsibility. I was on a school bus (marching band) on the way to a football game. So.... 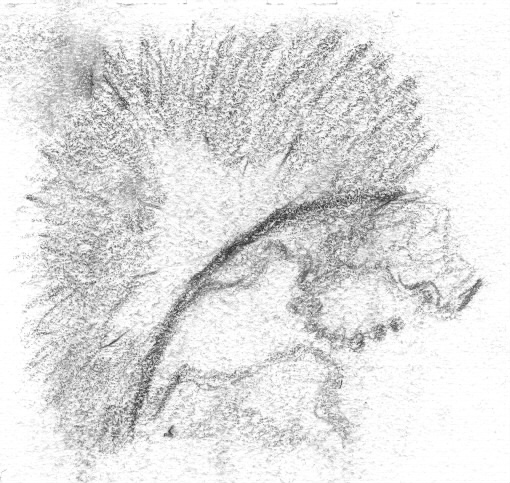 It is understandable then that it is drawn fuzzy- stuff was bumping up and down and all. Anyway, I draw Cassy too much. And she doesn't even look the same now. 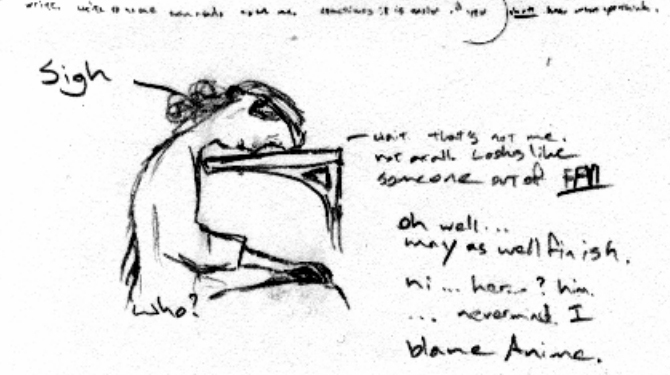 Neither does Leandra, who I haven't even drawn yet. Maybe I will now that she has hair. Anyway, I ramble too much. Keep going! A (kinda) picture of the person who drew this pic and all below it. 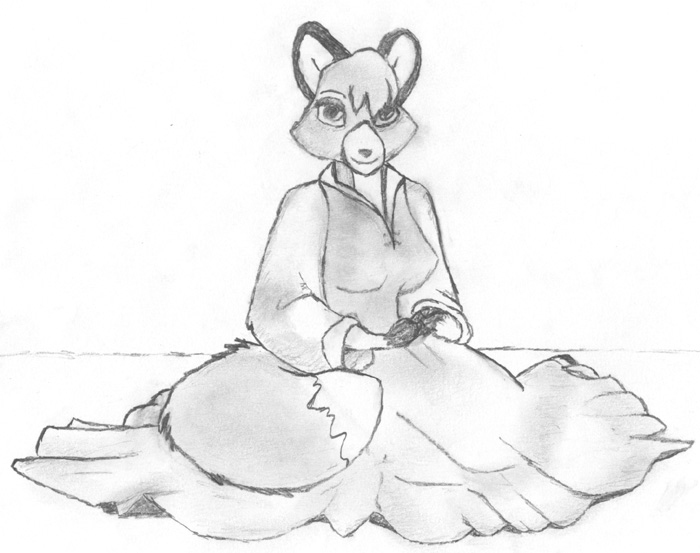 Her real name is Tracy, and no, she's not really a fox, but here, she is Hali, and she is one. Confused? Good. 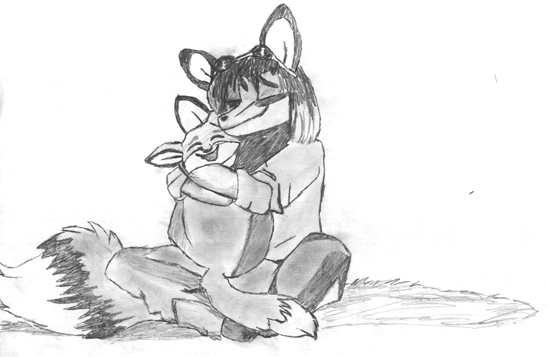 Anyway, you can see her art, including the originals of all of mine but Schala, at her page. She rocks, and I'll probably get her permission to be posting this stuff pretty soon. The fox she (yes, strangely enough also a fox, but not exactly) is holding is named Tom, if anyone cares. Yes those are sunglasses. Sorry the tail got a little cut off. 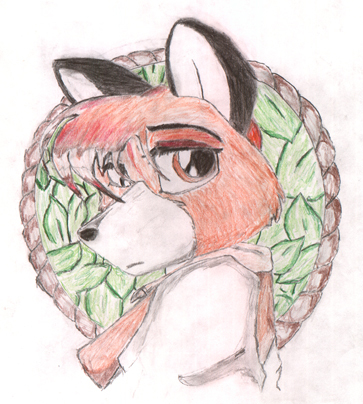 This is Cassy's guy, Fox. He has a real name, but I'll leave the story around that to those industrious enough to go visit the REAL art page these are copies from. If you read the character description, then be noted that he is me. In many many ways. Or is that just wishful thinking? Anyway, I really like how this one turned out also. Good stuff. This is my favorite of the characters that Tracy has created, Cassy. This is my second drawing of her, the first one is just below. 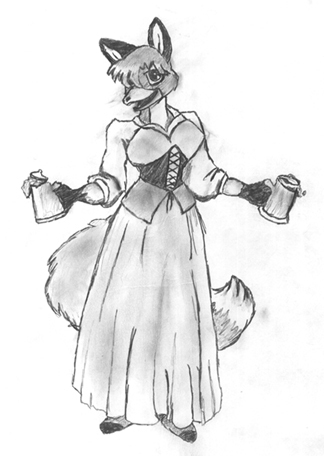 She's here in her barmaid outfit, having fun, I guess. If you're interested in her character, go visit Tracy's art page. As to the picture, well, I think it's pretty good. Still sad that I have to copy other people's work (not trace, mind you, but actually draw just from looking at the original, but still copy anyway) but I'll live I guess, and I'll be doing my own stuff soon enough hopefully. 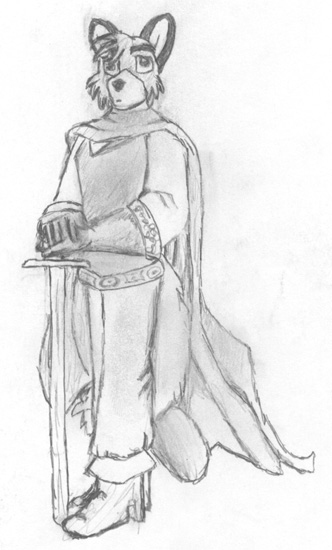 This is the first decent drawing I ever did. 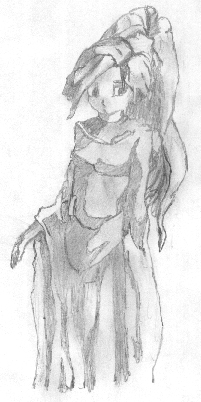 It's from a picture of Schala (from Chrono Trigger, by Squaresoft) that has been floating around the net several years, I think. Anyway, it's neat. I like.